This pathworking is intended to serve as a key to those energies within you. Print the pathworking out, find a quiet place where you will not be disturbed and read through it, spending time to look at each of the astrological glyphs. Take your time and if you are called to pause within one of the signs longer, do so, simply allowing whatever additional information wishes to present itself to you. When you have completed the pathworking, lay the papers aside and simply “be” in the energy that has built around you. Journal anything you wish later, but just allow yourself to drink in everything before you begin to write. Turn your focus and attention to your breath. Allow the space of your consciousness to move with the rise and fall of your chest and the filling and release of the lungs. Continue in this manner for several breaths; allowing each to become softer, smoother and slower. With each breath your physical body appears to become lighter and your center of consciousness floats upwards towards the inner eye. You feel enveloped by the mist of transition between the Physical and Astral. And as this veil thins you step through a veil of dark blue mist and find yourself standing centrally in a circular room. As you look around you see that this space opens out to a star lit night sky. The velvety blackness above holds a twinkling of starry light that fills the panoramic view above. The walls encircle you and are of a deep bluish purple. There appear to be archways carved into twelve equidistant spaces around the wall; but no openings are visible and you pass this thought off as being the stuff of your imagination. As your eyes adjust to this room you notice there is indeed an archway just ahead of you; its opening clear and distinctly edged. It glows a deep blood red in color and you are intrigued by what may lay through the archway. You step forward and pass easily through the archway stepping through the glyph of Aries and out into a room that is vibrantly colored red. You see the astrological sigil of Aries, the beginning of the Zodiacal cycle. The Cardinal modality of Aries wells up inside of you and you feel a surge of youthful exuberant energy wash over you. You feel energized and alive as though the spark of flame within has been ignited and the call to action trumpets through your will. You take a deep breath in and stoke the fires of creativity within; energized by its ruling planet of Mars. You feel the assertive nature of this energy and the desire to share your creative efforts. You feel the quickening nature of this place and instinctively step towards the opening of another archway just ahead. There is a glow of soft green light and you immediately feel compelled to step through driven by curiosity. As soon as you step into this room you notice the powerful glyph of Taurus. You also notice that it is a bit more difficult to move quickly in this space. It is as though you have become fixed or rooted in the spot on which you are standing and although you wish to move forward there is a bit of hesitancy as you stand your ground. You acknowledge that this feeling s the Fixed nature of Taurus; its strength coming from the stability and foundation of earth and the realm of manifestation. You see in your mind’s eye the bull of Taurus, raised above and spreading the wings of higher expression of earthly matters. You know see that the strength that is achieved in Taurus is bolstered by the effects of its ruling planet Venus and the skill and collaborative efforts needed to achieve this state of refinement in all physical doings. You are enticed to stay within this space of power and strength, but know that there is much more to be experienced. You move deliberately and with weighty step towards the next archway. As you step through the violet glow of the Glyph of Gemini you feel both energized and exhausted as your mental processes speed up and thoughts and ideas run through your mind at a lightening quick speed. This stream of flow expands and then subsides, a continual pulse and reminder of Gemini’s Mutable nature. Even the air around you seems alive and sparkling with tiny bits of particles and you are acutely aware of the Airy element of this space. You feel the need to speak out with the intent of widespread communication and release this accumulation of nervous energy and mental processes, much like the Divine Messenger Hermes acting through the energies of the planet Mercury. Mentally, you go through the pros and cons of staying where you are or moving into the next room. There is a brief moment of indecisiveness so you decide to move quickly and lightly through the next archway before you linger too long and remain caught in a loop of unproductive rationale. This is lit with a silvery hue and the glyph of Cancer beckons you forward drawing you in and offering rest from the frenetic energies of this space. As soon as you step through the archway and the glyph of Cancer the smells of the ocean and its waters permeate your senses. The fullness of moonlight reflects back from the sky above and you have a sense of moving and flowing energy throughout this space. Memories coming flooding through you and the Cardinal Quality that is Cancer issues them forth in bursts like the cresting of the water’s waves. There is a great sense of peace and potential for great healing in this space as though being held in the loving and trusted embrace of family. Your emotions rise up and fall away with each breath and each is held in its own container of intensity and gentleness. When you look again you see that there is a beckoning light of warmth is coming from another archway. You walk towards the golden light and step through the archway. Passing through the glyph of Leo, there is an intensity of heat and brilliance of golden light in this space. Leo’s ruling planet, the Sun, holds full command of this room and you feel as one standing on a stage, spotlight glaring in brightness and illuminating every detail of your being. The Fixed nature of this sign holds this illumined force steady and strong and offers up a feeling of courage and great pride in the efforts you have put forth in all your endeavors. You hear a low rumbling sound echoing within the space and the image of a regal Lion comes to you. He is glowing with the energy and ferocity of the Sun’s light, yet there is also a gentle protective quality underlying. You sense that he will protect that which he considers his own and be a formidable adversary to those who challenge. He lets out a thunderous roar and golden wings spread from his back reminding you of the Higher nature of the beast and the potential for spiritual Warriorship for right action that is held in this image. As these feelings move through the center of your being you notice an opening just ahead. The faint glow and color of violet glisten at the entrance to the archway. As you move forward through the glyph of Virgo you step into an energy that feels structured and organized, yet flexible in its boundaries. This is the Mutable quality of Virgo and the great sense of order is enhanced by the solid foundation of its efforts bolstered through the element of Earth. Although there are no furnishings in this room you have a sense that there is balance and great detail in the very energy itself. The temperature is just as it should be; the energetic flow surrounding you is just as it should be; as though there had been great effort in analyzing and sorting through what would be the makings of optimal experience for you. 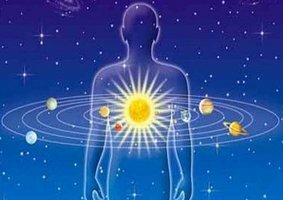 All of these thoughts somehow communicated through the physical nature of your senses, the work of the planet Mercury is one of its varied forms of communication. You feel a sense of clarity that would lend itself to the dissection and successful conclusion of any task presented. You feel comfortable in this place and would like to stay longer, but know there is much more to experience. As you look ahead you see the glowing light of soft green in the archway just ahead. You step through the glyph of Libra and at once your mind recalls past images of beautiful paintings and music, delicately crafted furnishings and jewelry and the beauty of all that has been part of your living experience. You see all these things with clearer and more distinct characteristic and feel the energy of the Cardinal modality of Libra’s balance of worth reshaping and rebirthing what is not of the correct measure. The Airy energy of mind and intellect whips about you and you feel as though you could speak articulately and succinctly about any experience or thought you may have and the desire to express and communicate pulses through you. You step towards the powerful energy that is beckoning you into its center. You are leaving the energy of Libra behind and hesitantly move towards the energy of Scorpio. The archway glows with a velvety blackness of the night sky and there is a distinct coldness as you approach the Glyph. As soon as you pass through the glyph of Scorpio you are engulfed in shadow. Glimpses of light are hidden beneath what appear to be shadowy figures and although you do not feel threatened, you know this is a place of great power and deserving of care and respect as you pass through. The energy of the space is pressurized and you feel as though being restrained. You know this to be the Fixed nature of Scorpio and the necessary restraint in facing those hidden parts of self. There is a sense of water in this space, but rather than the healing nature you experienced in Cancer, this feels as though you are at the very ends of the earth, ocean spilling over into a void of space that is unknown and a bit threatening. This great feeling of distance is birthed from the Planetary ruler of Pluto; cold, distant and occult in its true nature, yet powerful and potent in what transformative energy it may possess. You feel the pull of this space reaching and probing deep into the unconscious areas of your emotions and as a chill runs up your spine the image of a flaming phoenix fills your inner screen. All is ablaze and you feel uplifted and able to see more clearly than you imagined possible. As you settle into these feelings your attention is caught by a royal purple veil of energy within an archway just ahead. You eagerly move forward glad to be free of this space for the time. You pass easily through the glyph of Sagittarius. Little sparks of flame lay at your feet creating a straight pathway through which you begin to walk. You look down and get a bit closer to one and notice that from each of the sparks a single flower appears to be in the process of blooming. This is the Mutable nature of Sagittarius. Renewal from what is could destroy and consume. You have a sense that you must keep moving and that the path of your efforts, although splitting into many smaller courses, will find one of viability where you may move freely, without restraint. You wish to spread your reach far and wide and know this to be the expansive nature of Sagittarius’ ruling planet, Jupiter. You see with a sense of clarity of perception and feel the contractive nature that is needed just prior to release of great outpour of will. You take a deep breath in, visualizing yourself as the archer, bursting with enthusiasm at the promise of hitting the center mark, the strain of arrow pressed back against bending bow and the sigh of release and effort as it is sent towards its destination. The catalytic fire of this musing stirs you and you move towards the next archway, ready to explore what lay beyond. The entryway shimmers and seems to change color between a deep indigo blue and rich matte black. Just ahead you see the glyph of Capricorn. There is no distinguishable color beckoning you forward and you appear to be walking towards absolute darkness. Nonetheless, you persevere forward and find yourself standing at the base of what appears to be a sharp incline upwards. There is great trepidation as you move forward and the anchoring of earth’s energy seems to steady each step you take, giving the impression of sure-footedness. Nonetheless you feel the urge towards forward motion, this being the push of Capricorn’s Cardinal nature. Time seems to have stopped in this space and you are acutely aware that the atmosphere has taken on one of needing to have precise and definite goal in order to navigate this space successfully. You realize that this oppressive sense of discipline and structure are the dominant all pervasive energies of Capricorn’s ruling planet Saturn. You hesitate and think for a moment on what the purpose of scaling this incline might be and the need for this task to be accomplished now. You feel energized and alive and look across the space to see the glyph of Aquarius, lit up like a neon cobalt blue sign. You step purposefully and eagerly, crossing the threshold of space and as you step into the room you feel alive with energy. The air is pulsing with it and strands of lightening like currents run down the sides of the walls. You feel inspired and enlivened and all manner of invention and idea comes rushing into your mind for your consideration. You note the difference in this mental sensation from that of Gemini. The Fixed Modality of this Air sign confines, and transmutes this download of mental process and it is as though you can see everything from a greater perspective and are optimistic about the future that could be. You see everyone and everything as part of the greater whole and now have a renewed sense of how that whole may be served and of what actions must be taken towards a future that sees life as a unified process. Electricity moves through you, the gift of Uranus, the ruling planet of Aquarius and you envision your image filled with light, compassion and deep understanding. Wings of light extend from your back and you feel uplifted and whole; spirit and matter joined as one. As you are processing and thinking on these new experiences a feeling of great compassion and love engulfs you. You see the glyph of Pisces and know that this is what is calling forth your humane and compassionate self. There is an iridescent turquoise shimmer about the glyph of Pisces and as you step through the archway you are aware of being somehow underwater, yet able to breathe normally. The expanse of ocean stretches beyond and the soft sand on which you stand reaches backwards; neither beginning nor ending of either apparent. You feel a gentle rocking sensation as though your emotions are moving in response to the ebb and flow of the tides and once again you are struck b the sensation of both endings and the promise of new beginnings. This is the Mutable quality of the final sign of the Zodiacal wheel. Neptune’s trident moves undulating in tri-fold pattern of harmony within your being stirring and blending the waters of compassion, mind and spirit and the deep intuitive nature of the ruling planet opens new pathways of expression for your later use. The moisture of this space gives way to a deeper sense of clarity and deep insight colors every nuance of what you are experiencing. You allow these final thoughts to fill and flow through you, feeling the waters of your own nature blending in response. You step towards the entryway and pass through the arch back into the central room. In looking around it is hard to believe all the treasures that lay behind this circular wall and you think back on all the lessons that each passageway held. You can now also see more clearly and acknowledge that your original impression of open archways placed around the room was indeed correct. As you stand in this mood of reflection you see that each of the glyphs of the zodiac comes into view around the wall. Each sign held in its place of order of evolution from Aries all the way around to Pisces. They become larger and move away from the wall itself and hover in midair encircling you. Each symbol resonates with you in some way. Some, more than others, are predominant and catch your attention more fully. You stand quietly and receptive to the energy and the growing depth of gnosis that you are feeling about your place in the cosmos. This is the wisdom of your place among the stars, and the stellar blueprint that you carry within. Gently, a mist of mother of pearl colored energy surrounds you and the astrological glyphs fade and move back into their places behind the circular wall. This is the veil of transition and juncture between your visioning and the manifest world. You feel yourself enveloped in the veil of transition between the Physical and Astral world. The veils of transformation and all they contain gently fade from your sight and you begin the descent back into your physical state of being and the room and space in which you began this pathworking. Return to awareness of the rhythm of your breath and the rise and fall of your chest. Become aware of the physicality of where you are sitting or laying… your body pressed against cushion, chair or floor. This entry was posted in Bonus Material, CofMagick-Lesson two, Cornerstones of Magick, Hall of Celestial Wisdom. Bookmark the permalink.